Black Jack is a medical mercenary, selling his skills to the highest bidder. He is a shadowy figure, with a black cloak, eerie black-and-white hair, a scar across his face and partially black skin. Black Jack cures patients indiscriminately, from common folk to presidents and yakuza leaders. To his VIP patients, he charges absurd sums. All this has given him a reputation for callousness and greed which he gleefully cultivates. 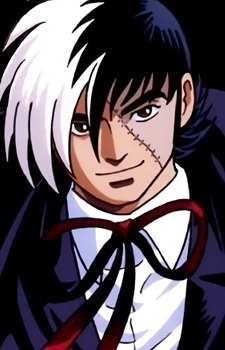 However, to the reader it is clear that Black Jack actually is a good man: he is anti-wealth and anti-prestige, and believes he is actually doing rich people a favor by removing their material wealth. The opposition to wealth and power is a common theme in Tezuka's work: powerful men are almost always portrayed in a negative light.